I know the forums may have some inactivity at times, especially when trying to contact staff. Please send an email or reach out through Facebook for any questions if you cannot reach someone for information. It will take some time to get forums up to par. Stop using the report feature to ask for content. That's not what it's used for. This topic has been moved to Tech Issues. For those of you who are friend with members that have been recently banned, please ask them to refrain from making multiple accounts. If you are breaking rules we have to enforce them. The staff here will be creating a page soon where banned members can appeal their ban and we will take certain things into consideration. I will post the criteria for that by the end of this week. In the mean time. We are scanning the forums for any type of activity that goes against BVEStation rules and will enforce them. Let's try to have fun this year, but be respectful and do things the right way. BVEStation Network News / BVEStation: Let's make 2017 Great Again!! Some old members may remember me, others may not. But I am trying to find new ways to help spice up the site or add any features that members would like to see in the future for BVEStation. The staff, pac & myself would like to know how we can make the user experience for all, much more enjoyable. Use this thread to submit any ideas. We (the staff) will try our best to implement these ideas. Please keep your ideas clean and try not to downplay someone else suggestions. I know I have contributed a lot to this site and many other forums . I notice a lot of users have been sending me private messages while I was missing in action from the site. I will be on here periodically to help upcoming developers or to answer questions about any content. If you feel that I have been taking to long to reply, you can contact me at my email address at agardimanuel@hotmail.com. I am also on the OpenBVE Connection page on Facebook for those who are online. Thank you guys once again for supporting BVE and its respective members and I would like to publicly thank ipaclansite and DJ Hammers for their works and having me here. I will try my best to be on here more to help users out with any issues or concerns. Its been a while since I seen the site and I havent been actively on here but after dealing woth DJ Hammers & Mr Railfan in person with some projects I think its time to reconnect with the users who still actively come here. So hello all and those who remember me. I AM BACK!!!!!!! There will be an OMSI simulation run on the OpenBVE Connection server tonight around 8:30pm. We welcome anyone here to join us. Please come in with your name or a proper username or your username from BVEStation. BVEStation Network News / NYCTBA Bus is now Hiring!! The NYCTBA Bus division will be hiring March 21, 2013 on the Teamspeak Server. OMSI DerBussimulator installed in your computer. They will be in the MTA Scheme. Any question on the MTA scheme or to download content speak to gtasandman or nyctrman. You can also contact Damien (5102) and Dr subway18 out new coordinator's for more information. NYCTBA MTA hiring will also conduct on the same day. All operators attend the event tonight. Blizzard OpenBVE Run. Due to blizzard conditions trains are running at slower speeds. - No (B) service. Use (A) (C) (D) or (Q) service. - (Q) terminates/originates at 57th Street. - (R) shuttle service starts early. - (J) terminates at Essex Street use (4)(5) for nearby stations. - (5) shuttle service starts early. Use the (2). - Some (L) trains terminate at B'way Junction. - (M) shuttle service starts early. No (Z) service. The electric service has been restored to the Netstasis system. They are working to get the system restored 100% as soon as possible, but no timeframe has been given when the server will return online. For now, please use the temporary server openbveconnect.dyndns.org. The fun doesn't stop as we are continuing tonights run schedule for the holidays. If you have Teamspeak you can visit us online tonight at 8:30pm. Please sign in with your BVEStation username. This will also help with people who would like to join the NYCTBA and get some training. BVEStation Network News / Christmas Run Schedule!! Sorry for the short notice but we are having a Christmas Eve run schedule in which all users can participate in. BVEStation Network News / Attention OpenBVE Users! If you are one of the few that use OpenBVE and would like to participate in our events you should come see us online on the Teamspeak Server, especially on weekends when a lot of our users is online. Also to keep people updated, MUDWRESTLE, CT1660, Rayvon, & myself are working on improving the graphical interface of OpenBVE. It's slow work but we are going to try to spice it up. We will keep the community posted on what progress we have made so far. Thats all for now & Happy December! 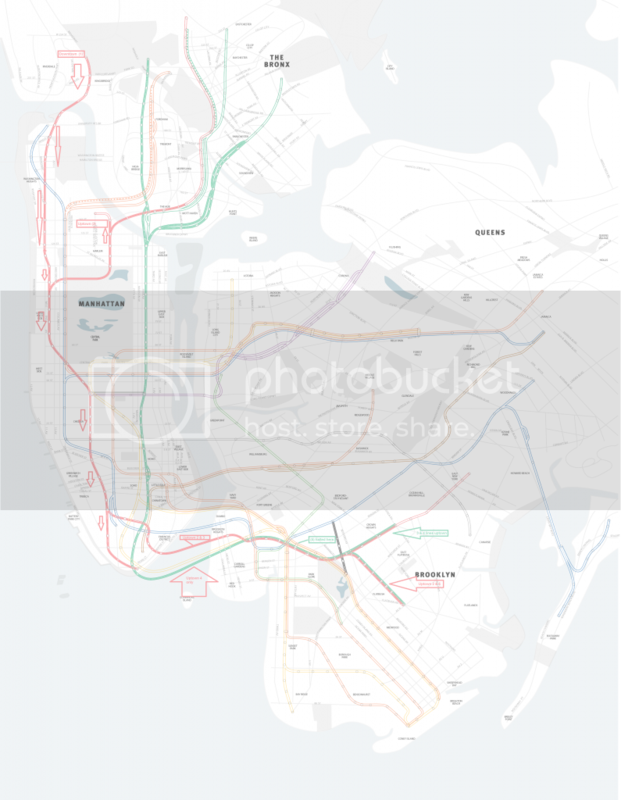 I have been looking into some site upgrades and with the help of the committee, we are able to make a realistic of subway map of all completed routes. It will features just a regular subway map but real scale drawn lines that will show what developers are up to. I will leave a link to the different development pages also around the site that will help you to keep track of what is going on. If anyone is handy with Adobe Illustrator CS6 then you should be able to help out. I will update this thread with an example screen shot. If your on a MAC computer, you can spread your two fingers on the mouse pad to enlarge the image. I am still working on the Windows enlargement process. Most of the routes listed are either only going uptown. I will label the few going downtown and add links to respective threads and developers.